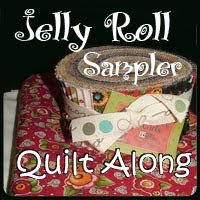 I was very excited to hear about Moose on the Porch Quilts's 2010 Jelly Roll Quilt-Along. Since we moved here, two years ago, I have not been quilting as much as I would like. Yes, I've made some pretty curtains and runners, but I haven't made any proper quilts. Indeed, it's been so long that, when I go in my sewing room and start sifting through patterns and fabrics, I become overwhelmed by my choices and start to doubt whether I have any idea what I'm doing. Yes, thank you, I know I am weird. Each block will be designed by a different person. 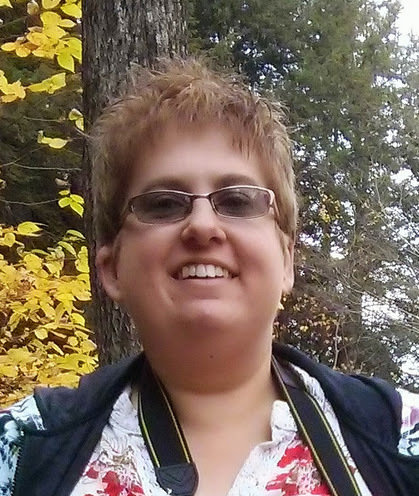 Every two weeks there will be a guest blogger on my blog introducing herself and her block. At the end, you will have made a fun quilt 58" x 72. As every block will be different, I am unlikely to get bored and I should get lots of practice with different techniques. With two weeks to complete each block, I have a definite (but generous) deadline to meet so no shirking (I hope) but no panicking, either! I think I will be using a jelly roll of Sandy Gervais's "Objects of Desire" for Moda, but I have not purchased the background and sashing fabric, outer border fabric, or binding fabric so I do not have a picture for you all yet. "Let the more loving one be me." "Fair is foul, and foul is fair ..."
Once upon a time, there was a witch who had two apprentices. One apprentice, Amanda, was very beautiful and practiced wicked magic. The other, Mira, was neither particularly beautiful nor particularly wicked, but adored her “sister” and wished to do whatever was necessary to please her. Alas, Mira’s adoration was misplaced for her beautiful “sister” used that love to trap Mira in a magical mirror and make her a slave. I have to say that, while Mira’s cunning ways and manipulation of others frequently bordered on wickedness, it was hard not to sympathize with her plight. After all, Mira had not chosen to be trapped in the magic mirror and, without a body, could only attain her freedom with the assistance (willingly given or otherwise) of others. Overall, a fast and enjoyable read for those who don’t mind a little moral ambiguity. Hard Love tells the story of John Galardi -- a lonely teenager who has starting writing his own zine. He befriends another zine writer, Marisol, but their friendship is sorely tested by John's crush on her. Marisol likes girls, you see, and John ... well, John doesn't know what he likes. Except that he'd reallyreally like someone to touch him. I read Wittlinger's Parrotfish in 2008 as part of the A-Z Reading Challenge and enjoyed it so much that, when a student came in raving about Hard Love, I knew I had to get my hands on a copy. I was not disappointed. Wittlinger has perfectly captured the confusion and loneliness of young adulthood without lapsing into pure pathos. The subtitle really gave it away -- this book was not about butterflies so much as about the ways humans (for good or ill) interact with butterflies. While interesting, it left me feeling kind of "meh." This is not Laufer's fault -- I just think I would have been happier reading Sharman Apt Russell's An Obsession with Butterflies which is more "science-y." Bashi recounts growing up in Iran and all the things which occurred that eventually led her to immigrate to Switzerland in 2004. Bashi pulls no punches and Nylon Road is as much an indictment of Western culture as it is of Iran's "religious" regime. A hard, but entertaining read. Based on a blog by the same name, this book covers Reid's attempts to lose weight. It's a satisfying, if light, read and the built-in animated flip book made me grin. I would, however, not recommend purchasing this book as it is a more-or-less straight regurgitation of her blog. Just go to the dietgirl archives and start reading. "I am a draper mad with love." "I am a draper mad with love. I love you more than all the flannelette and calico, candlewick, dimity, crash and merino, tussore, cretonne, crepon, muslin poplin, ticking and twill in the whole Cloth Hall of the world. I have come to take you away to my Emporium on the hill, where the change hums on wires. Throw away your little bedsocks and your Welsh wool knitted jacket, I will warm the sheets like an electric toaster, I will lie by your side like the Sunday roast." Tyranny by Lesley Fairfield‭ (‬Tundra Books,‭ ‬2009‭)‬. Tyranny‭ ‬was a hard book to read.‭ ‬Yes,‭ ‬it moved along quickly‭ ‬and I found Fairfield‭’‬s illustrative‭ ‬style to be quite‭ ‬gentle‭,‭ ‬but‭ ‬the subject matter was heavy and grim.‭ ‬While‭ ‬I‭ ‬appreciated that‭ ‬Anna‭ ‬does eventually find the strength to fight Tyranny and‭ ‬rebuild her self,‭ ‬I wondered how many people never escape their Tyranny‭’‬s‭? ‬(It did not help that,‭ ‬while googling this book,‭ ‬I‭ ‬inadvertently stumbled‭ ‬upon‭ ‬several pro-anorexia blogs‭ ... is the world really so fucked up? )‬.